This broad-market approach involves IEMG tracking the investment results of an index that consists of all types of emerging market equities — large-, mid- and small-cap companies from around the globe that are all included in this fund. 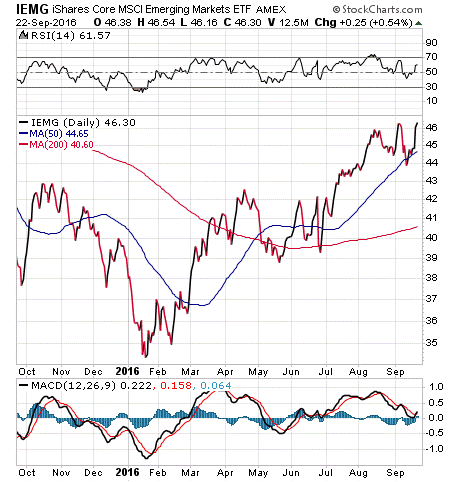 Founded in 2012, IEMG originally was viewed as a cost-effective alternative to the main emerging market benchmark ETF, the iShares MSCI Emerging Markets (EEM). IEMG is fairly well diversified among different sectors, but its biggest investments are in technology, 23.18%) financial services, 21.56%, and consumer cyclical, 12.34%. The fund’s top holdings and their percentage of the portfolio’s assets include Tencent Holdings Ltd., 3.72%; Taiwan Semiconductor Manufacturing, 3.52%; Samsung Electronics, 3.46%; Alibaba Group Holding, 2.79%; and China Mobile, 1.85%. 25-year veteran trader Billy Williams explains why a company should not be managed by its shareholders, but actually by people who know about the industry and care about the business.